Embattled Cook County State's Attorney Kimberly Foxx on Wednesday said she played no role in the controversial decision to drop all the charges against "Empire" actor Jussie Smollett and insisted he did not get special treatment from her office. "Mr. Smollett was afforded the same opportunity that anyone in Cook County who had a nonviolent offense and the required background check would get," Foxx told NBC Chicago. "I was not part of the charging decision," she said. Foxx spoke out just hours after the Chicago Police Department released 61 pages of investigative reports filed by detectives who concluded that the Smollett's claim that he was the victim of a racist, homophobic attack was a hoax — and after the police were barred by a court order from releasing anything more. "Jussie SMOLLETT made false reports to police claiming to be the victim of an Aggravated battery/Undetermined motive," the reports allege. 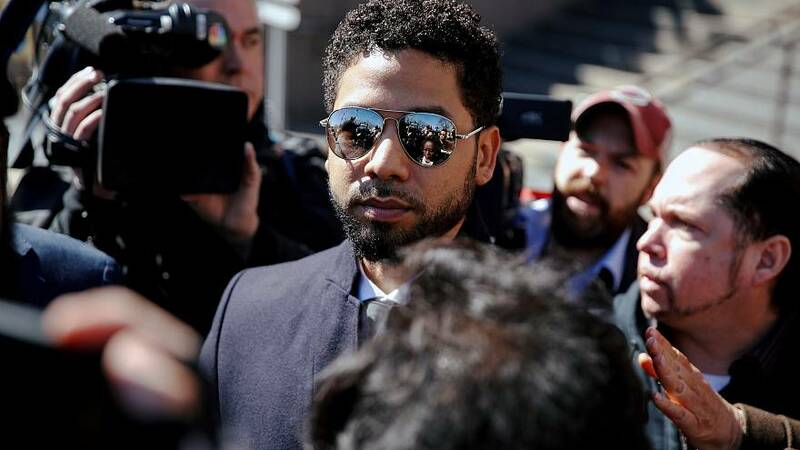 Smollett, who is black and gay, was indicted on 16 counts for allegedly filing a false police report, but the Cook County State's Attorney's Office stunned many in the public by suddenly dropping all charges against him on Tuesday. Chicago Police Supt. Eddie Johnson claimed his department was blindsided by the move and — along with Chicago Mayor Rahm Emanuel — was harshly critical of the decision. Much of the criticism over the decision to drop charges has been directed at Foxx, even though she had recused herself from the case on Feb. 19. After her recusal, Chicago news outlets reported that Foxx, who is the county's first black female state's attorney, had tried to persuade Johnson to turn the case over to the FBI, which raised questions of whether Smollett might be getting special treatment. The Chicago Sun-Times reported that Foxx approached the police superintendent because Tina Tchen, a Chicago lawyer and former chief of staff to first lady Michelle Obama, had put the state's attorney in touch with members of Jussie Smollett's family just days after he told police he was the victim of a homophobic, racist attack. Tchen, in an email to NBC News, confirmed that account. "I know members of the Smollett family based on prior work together," Tchen wrote. "Shortly after Mr. Smollett reported he was attacked, as a family friend, I contacted Cook County State's Attorney Kim Foxx, who I also know from prior work together. My sole activity was to put the chief prosecutor in the case in touch with an alleged victim's family who had concerns about how the investigation was being characterized in public." NBC News also reached out to Michelle Obama's spokeswoman, but received no response. In an interview with WMAQ radio, Foxx said she made the decision to recuse herself in consultation with her ethics officer. "I did not want, as this investigation changed, for there to be any question about my impartiality so I removed myself from the mix," she said. Foxx said that at the time she spoke with the Smollett relative, the actor "was considered a victim in the case." As for Johnson, Foxx said she alerted the chief that she had spoken with the Smollett relative and that she continues to have "a good and healthy relationship with the superintendent." "He recognizes the attention and the notoriety this caused," she said. "He also recognizes that this disposition is not outside of the realm of what we've seen before." "I know he can attest that this case was not treated any differently than someone who was similarly situated," Foxx insisted. Foxx's remarks echoed an earlier statement on Tuesday by her spokeswoman, Tandra Simonton, who said the Smollett case was treated no differently from the more than 5,700 other "cases for alternative prosecution" that the office has handled in the past two years. After the announcement that the charges against Smollett were being dropped, the Iocal Fraternal Order of Police repeated a request to the Department of Justice to investigate Foxx's role in the case. "DOJ declines to comment," spokeswoman Kelly Laco responded to an email from NBC News asking Justice Department's response to the police union's request. The police union is no fan of Foxx, who was elected in 2016. The organization supported the incumbent prosecutor Anita Alvarez, who was harshly criticized for waiting 13 months to prosecute a white Chicago police officer captured on video fatally shooting black teenager Laquan McDonald.